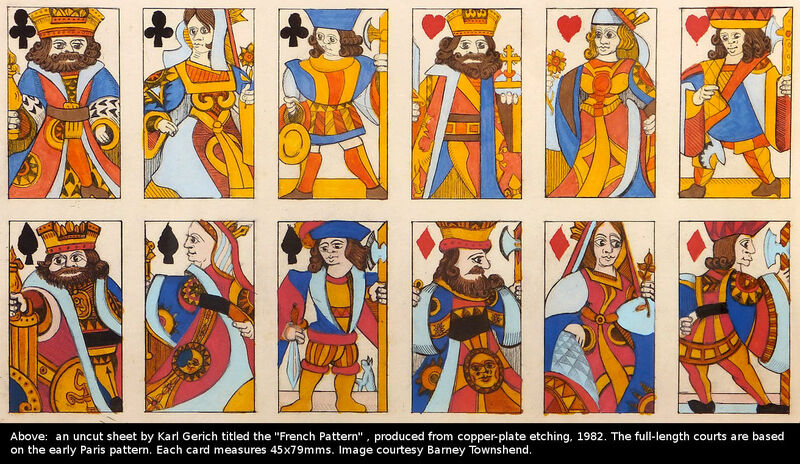 Karl Alexander Gerich's interest in playing-card production came to the fore while studying at Bath Academy of Art from 1975. 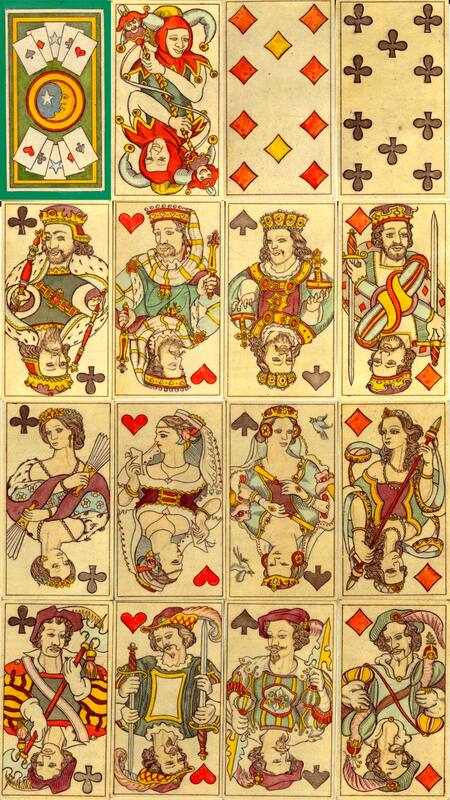 Karl produced a unique range of hand-made playing cards during the period 1980-1998. 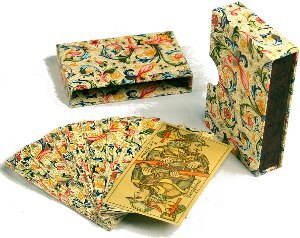 His designs were inspired by early traditional playing cards, the English pattern and other European designs, packs produced by 19th century European manufacturers (B. Dondorf, Glanz, van Genechten, VSS, Grimaud, Piatnik, etc), resurrected once more by Karl's burin and given a new lease of life. 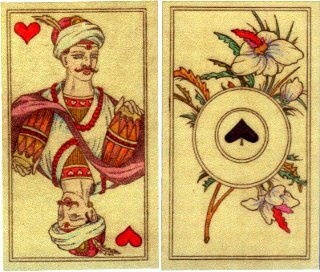 He produced mainly French-suited packs with 32 or 52 cards, and his packs often included exotic pictorial Aces and special Jokers. Acknowledgement: thanks are due to Daphne and Mike Tregear who were close friends with Karl and supported him in many of his productions. Donald Welsh was also a close friend and patron of Karl's work. Much of the background information has been sourced from them. Barney Townshend has also kindly contributed images of most of Karl's work in the form of finished packs, proof sheets and hand-made boxes. 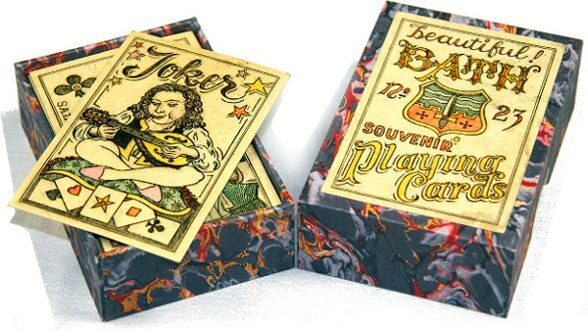 Packs were usually numbered somewhere on the Joker, a court card or the box, and the numbering system has been worked out from there, with corrections by Karl. Some packs were untitled / unnumbered*. * Note: Regarding the numbers and titles of packs, some projects were started one year but not published till several years later. 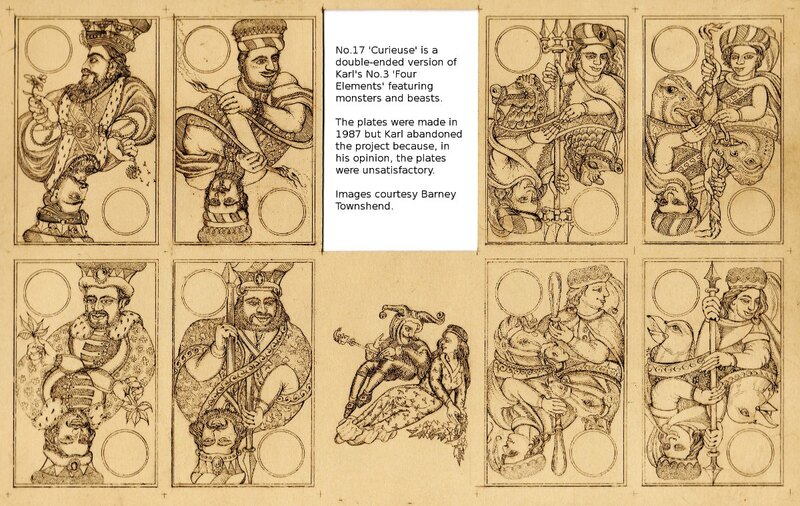 Karl rarely produced all of one work in the same year, but went back to finish a project at a later date, so signed dates on individual decks issued can vary. Karl worked from his sunny studio flat in St Peter's Terrace, Bath (UK) where he had his own Adana printing press. 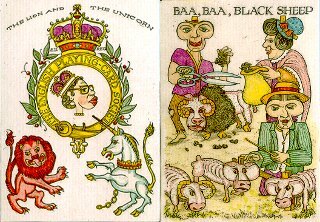 All his packs were produced from steel or copper plate etchings and hand coloured by himself or his partner Georgina Harvey. 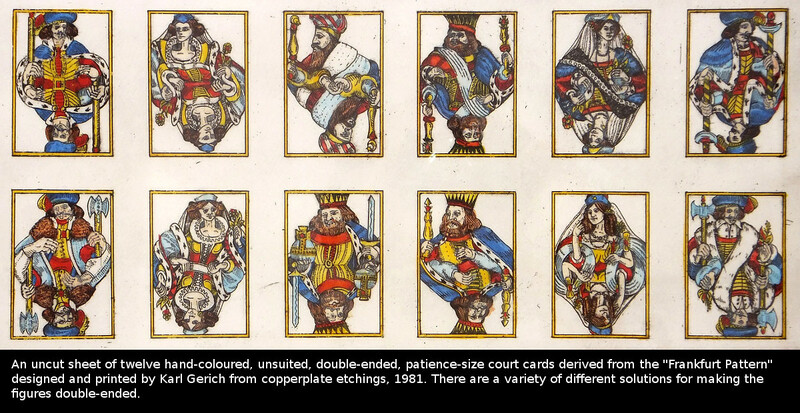 They traded as "Victoria Playing Card Co." between 1 May 1989 - 17 December 1990, otherwise Karl traded as himself. 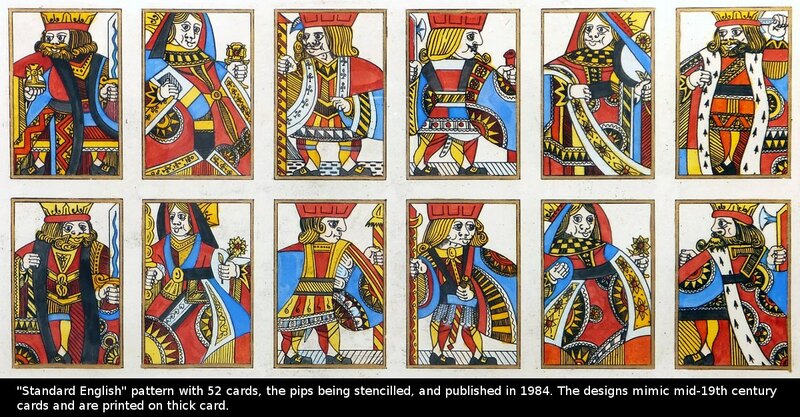 By looking at Gerich’s patterns and designs, like music or poetry, they show where the artist finds beauty… In general Gerich leans towards humanity in his designs, with excellent characterisation to his subjects. He reveals a feeling for natural beauty and artistic rhythmical movement. But the strangest other-worldly creatures also intrude, suggesting the supernatural. 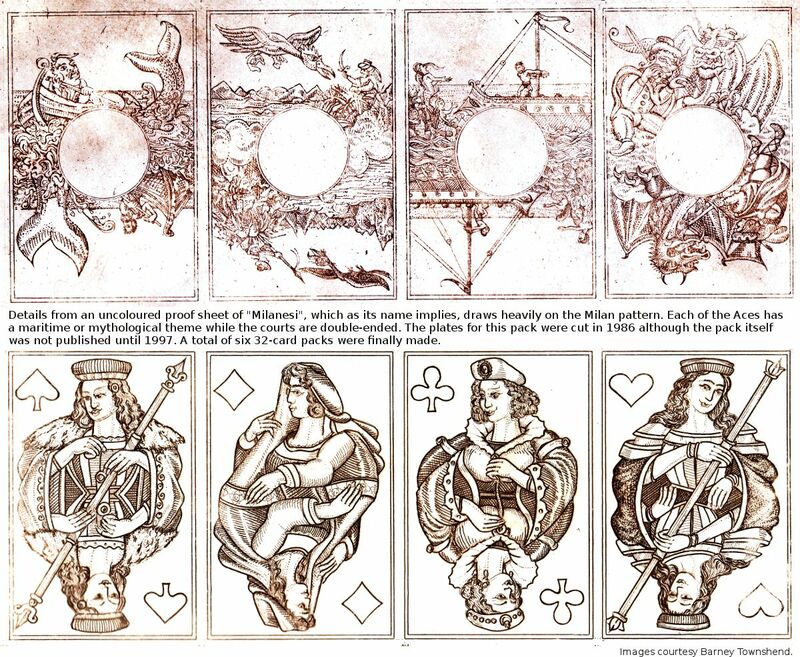 We see chimera monsters, mermaids and satyrs, phoenixes, playful lovers and cupids, sea dragons and serpents, the mystique of orientalism, tricksters and jesters... The romance of distant lands finds expression in the exotic blend of Turkish and Hindu fantasies (Patience Indien No.16, Cartes Turques No.18, Ganesh No.35), whilst the theme of sea-borne trade and adventure is again carried further (Four Corners No.10, Milanesi No.13 and Triton No.31). Roman mythology is apparent in the Beautiful Bath No.23 and Aquae Sulis No.32 packs, whilst slightly grotesque gothicism characterises his Four Elements No.3 and Deutche Karten No.9. The opera is the subject of a further two packs (Siegfried No.27, Cosi Fan Tutte).